October | 2010 | Let There Be Food! Quinoa is baaaack! When we were in Abilene, my dad brought a copy paper box FULL of different kinds of peppers to share with us. I brought back poblanos, Anaheims (red and green), jalapeños (green and purple!! ), and banana peppers. I’m about to have to freeze several of the jalapeño and Anaheim peppers to keep them from spoiling because I brought home that many. Last week, I got very creative in my meals trying to use them up. You will see a few recipes from those endeavors in the next few weeks. This particular recipe has a shameful inspiration, actually. Many people out there have guilty pleasures in the form of various TV shows; I have guilty pleasures in the form of various questionable food items. There is no need to reveal them all in one fell swoop, but one of them is a certain Mexican TV dinner that came with cheesy Mexican rice. When contemplating a bunch of peppers and thinking of quinoa, it all came back to me in a flash. 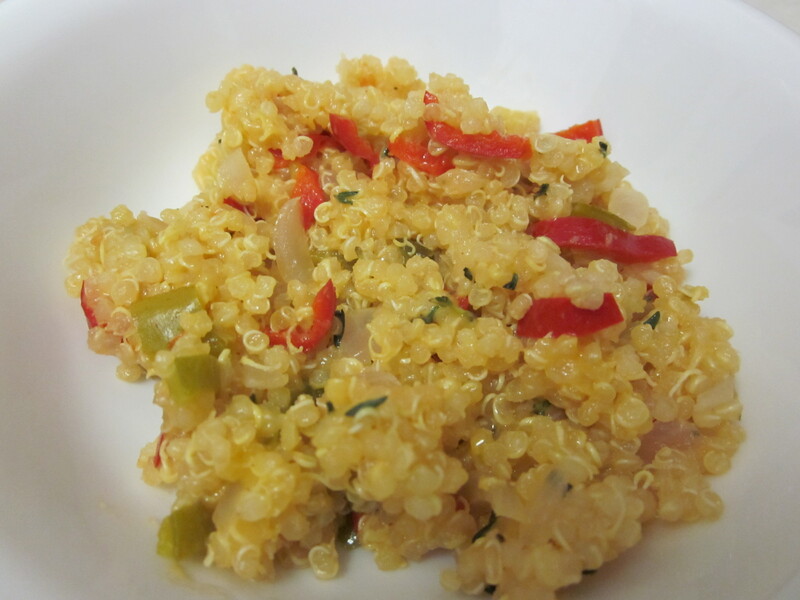 Cheesy-peppery Mexican quinoa, it is! 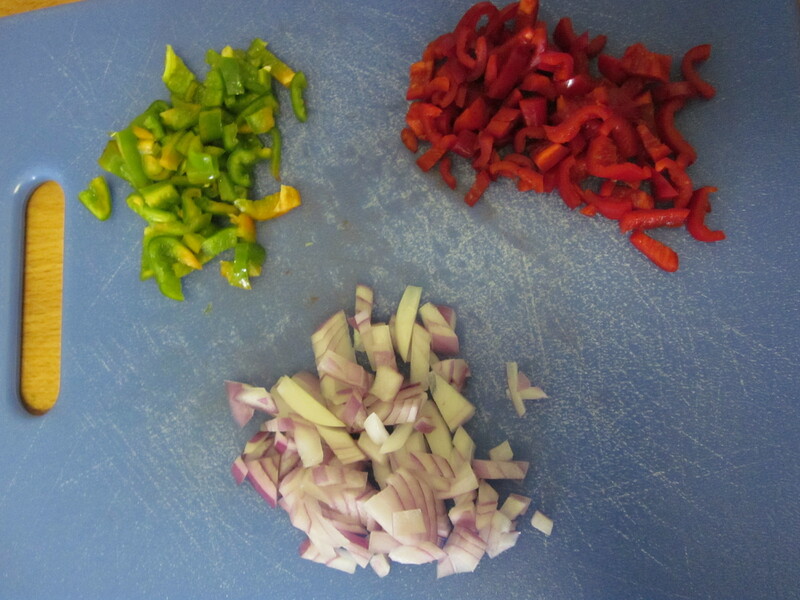 2 diced Anaheim peppers – I used 1 red and 1 green because I had both. 1. Chop up the peppers into your preferred bite size. I seeded mine; you go with your personal heat preference. 2. Combine quinoa, lime juice, salsa liquid, salt, and water in a saucepan. Cook on high heat (6 or 7 on the dial) until it is boiling. 3. Add peppers and give it a quick stir. Cover and simmer on low (1 or 2 on the dial) for 15 minutes. 4. When 15 minutes is up, remove from heat and let sit, covered, for 5 minutes. 5. Finely chop the thyme. Grate the cheese. 6. Stir in thyme and cheese until cheese is melted. Isn’t that ridiculous easy? Yes, I thought so as well. My friend was over for dinner, and she went back for seconds on the quinoa. I was pleased to see she enjoyed it. I enjoyed it for lunch leftovers the next day, myself! For variations, you could substitute any variety of peppers or use Monterey Jack cheese. Oooohhh! I bet a jalapeño jack would be quite delightful and add a bit of kick. I did seed my peppers, but I might leave some seeds or possibly the ribs in next time for a little extra heat. Garlic might also be a positive addition to this dish. 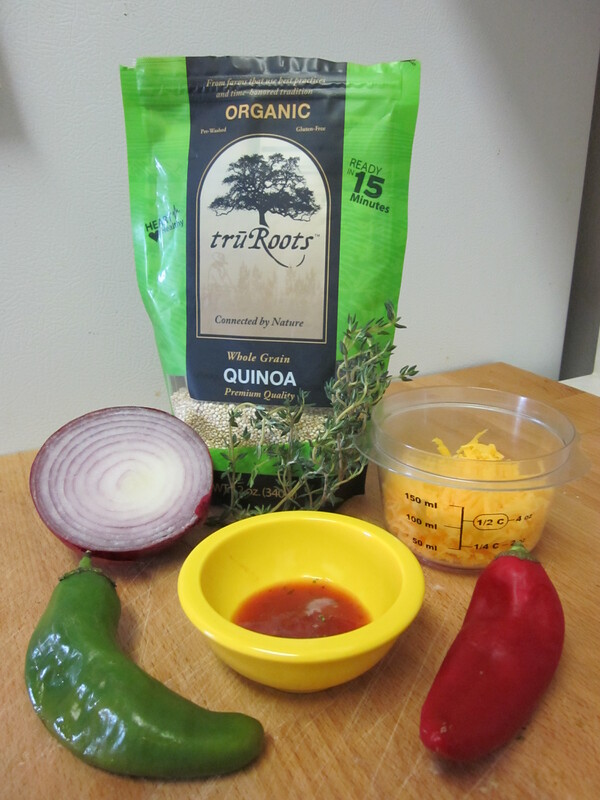 If you prefer a crunchier onion or pepper, wait until you are letting the quinoa sit for 5 minutes to put them in. You’ll get a light steam but still have plenty of crunch. A note about adding herbs: When using fresh herbs, it’s better to add them at the end of the cooking/heating process, so they retain more of their flavor. If you added the thyme in with the quinoa at the beginning, it would boil away the tasty flavor and leave you with a bitter, unfortunate flavor in your dish. Fresh herbs are more delicate than dried, so you can, and probably should, add your dried herbs earlier in the cooking process. This allows the herbs to rehydrate a bit and flavor the entire dish. Your recipe should tell you when. When I wing my recipes, I usually add the dried herbs in prior to any boiling or simmering. 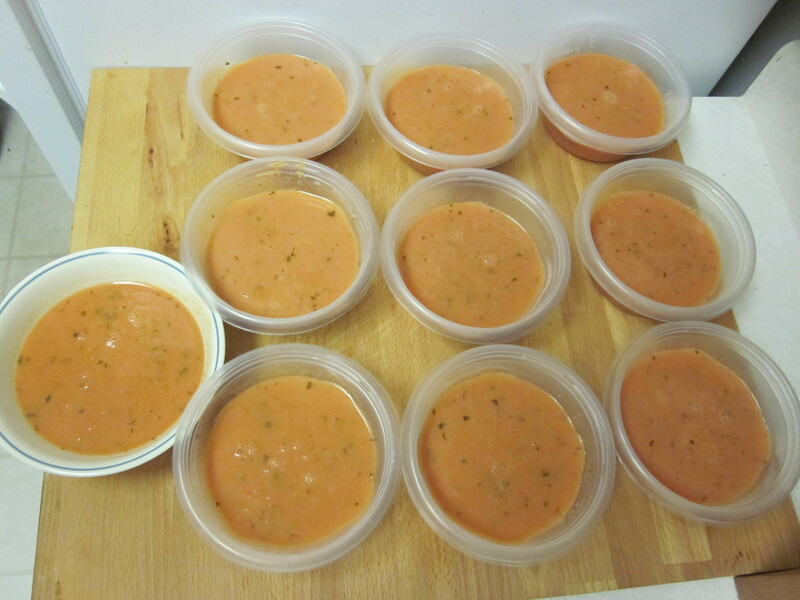 For years, I turned my nose up at tomato soup. I can’t even tell you why I didn’t like it growing up; I just didn’t. All I knew was Campbell’s canned soup which did not look appealing or tasty to me. At some point in my late high school or early college years, I went to La Madeleine and bravely tried their tomato basil soup. The skies opened, and my taste buds rejoiced at the deliciousness I was consuming. Seriously. It was so good. My best effort at explaining why this soup was so good usually went like this: “I don’t know why it’s so good. Maybe because it’s a thicker soup than Campbell’s?” So eloquent of me, I know. Many years later as I was discovering my culinary inclinations, I began to wonder if I could replicate this soup. Thanks to Google, I found a knock-off copy recipe that swore to be just like that which La Madeleine serves. Sadly, the nutritional content is listed next to the recipe which made it impossible to ignore the facts in front of me. The reason this soup is so good is because 82% of the calories in the recipe come from fat. Yes, dear friends, 82%. I’ll just give you a minute to wrap your brain around that. The first time I made the soup, I followed the recipe mostly exactly the same. I did misread the recipe from the very beginning and immediately cut the butter from a FULL STICK to a half stick. Beyond that, I did what the recipe asked. Holy tomato soup deliciousness, Batman. It was SO.GOOD. Although it was a bold claim to be just like the soup from the restaurant, it was not an inaccurate claim. I ate it that way for many years. But then I started to make more healthful food choices and didn’t feel good about there being so much fat in my soup. Thus began my slow journey to create a delicious soup that wasn’t a bajillion fat calories. It’s hard to figure out how much butter and cream you can reduce or replace and still keep your soup tasty. 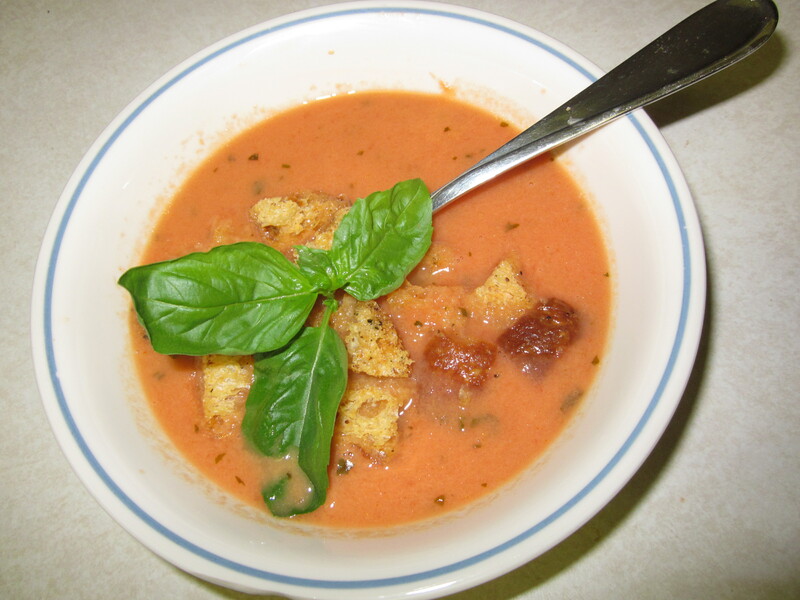 I tend to enjoy a thicker soup, as a general rule, but thin soups are a great vehicle for using your homemade croutons. With less cream and butter, the soup thins out a bit, but the taste is still delicious to me. I hope you enjoy it too! 1. 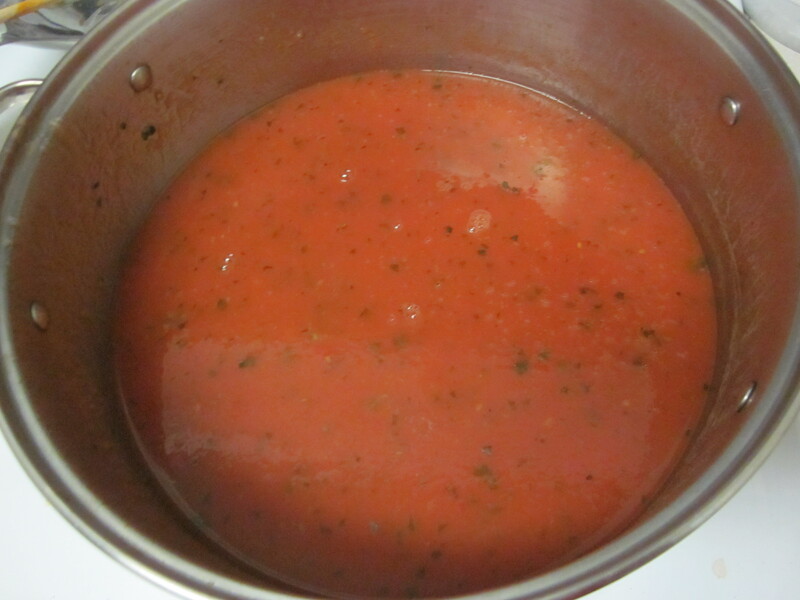 Combine tomatoes, tomato juice, and chicken stock in a stockpot. Simmer for 30 minutes. 2. 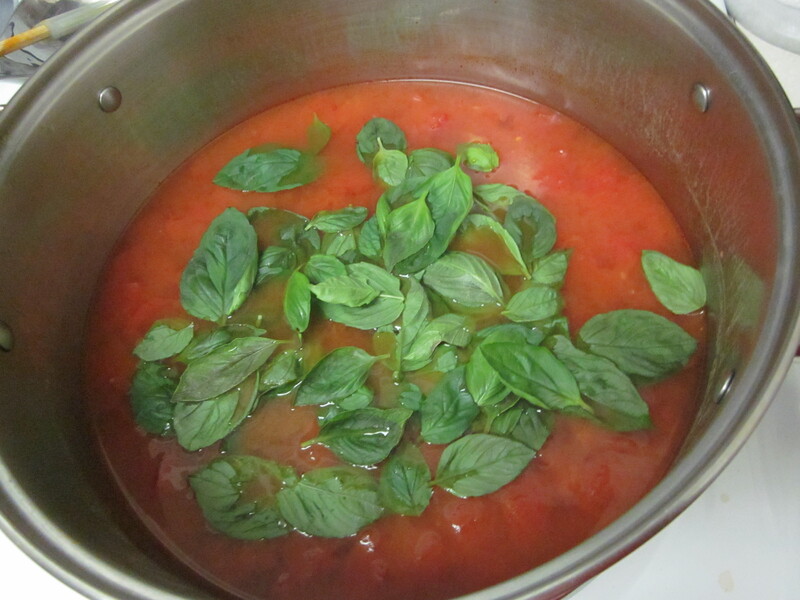 Add the basil leaves and blend. A. 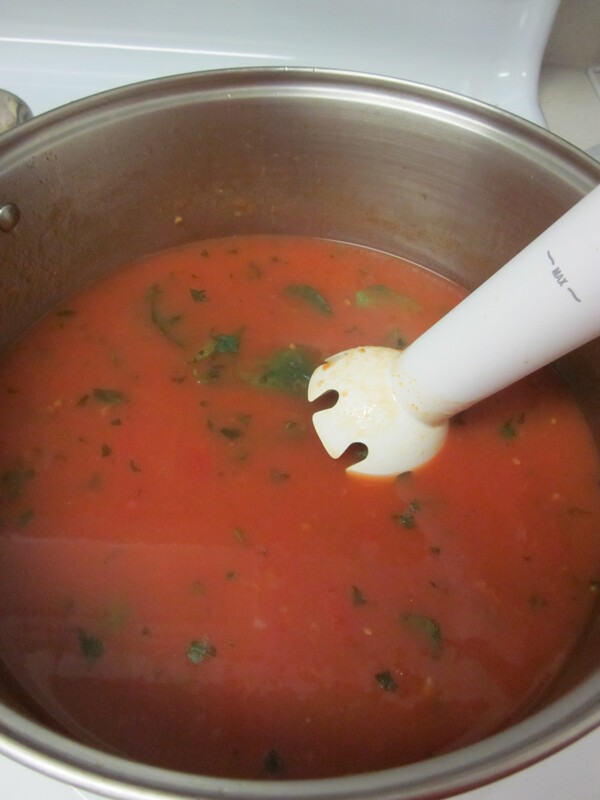 If you have an immersion blender, bust that baby out, and put it to work on those basil leaves and tomato chunks right there in the pot. B. If you use a regular blender, you’ll need to work in small batches (1 or 2 cups, max, per batch). If possible, remove the center knob from the lid of your blender so the steam can escape without blowing the top off. Work slowly and carefully. 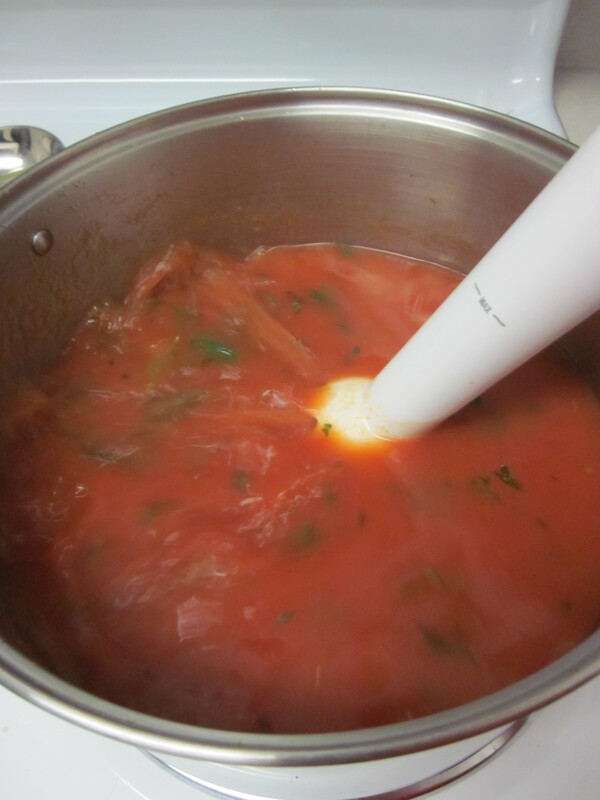 This step does add more time and dirty dishes as you’ll need to move the unblended soup to a large bowl so that you can put the just-blended-soup back into the pot. Be careful in transferring that much red liquid. Might I suggest wearing an apron? When all the soup is blended and back in the pot, you are ready to move to step 3. 3. Add butter, and stir to melt and combine. 4. Slowly drizzle in cream, and stir to combine. If you are using real heavy cream, it should NOT curdle when you put it into the soup. If it curdles, something’s wrong with it. 5. Add sugar, salt, and lemon juice. Let it sit for a few minutes so flavors can combine. If you plan to make this soup a staple, I highly recommend growing your own basil as basil in the grocery store can be pricey. You don’t have to use 60 if you are intimidated by that. 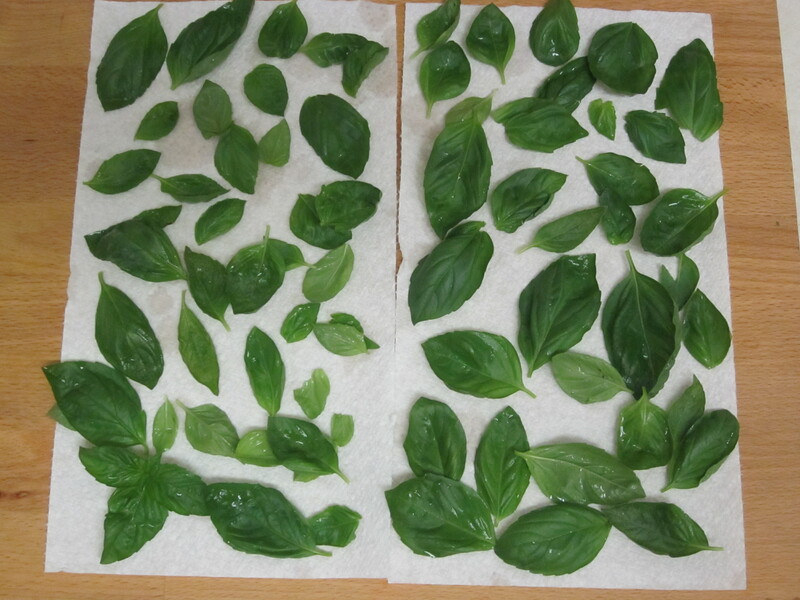 I have a prolific plant, and I love basil. I also STRONGLY recommend investing in an immersion blender. It really will enhance your soup-making experience. I’ve also used it in salsa-making with great success. It’s a pretty great tool. 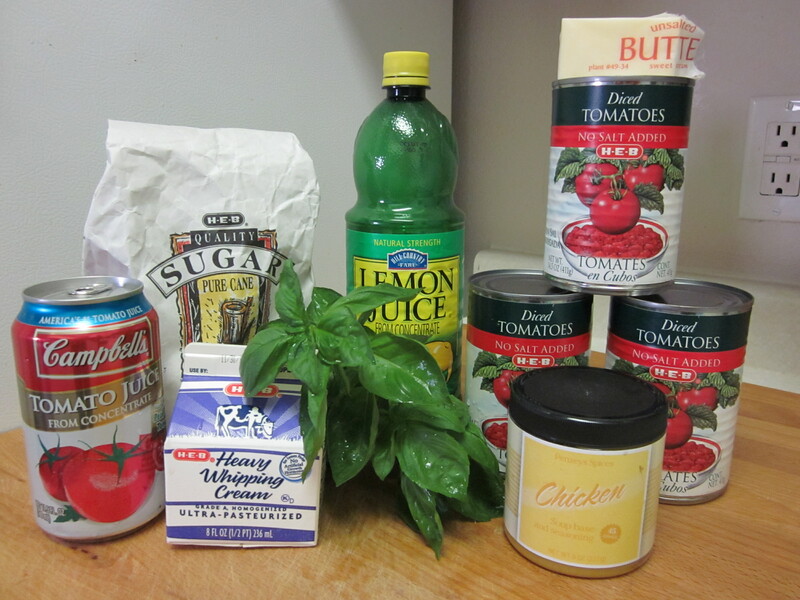 I experimented with different kinds of dairy products in my efforts to reduce the fat content, with varying results. Half and half curdled lickety-split. Some research claimed that if I slowly heated the half and half prior to adding it to the soup, it wouldn’t curdle when I put it in. I wasn’t confident enough to go down that road again, though. Evaporated milk did okay, but it impacted the taste a bit. It wasn’t bad, just not what I was looking for. Less butter seemed to be an okay decision. Then it occurred to me that I could theoretically increase the rest of the main ingredients and use a smaller amount of heavy cream. If my math is correct, that should significantly reduce the fat content. I learned that heavy cream is the most stable dairy product out there, so I decided to keep the original ingredient, just reduce the impact it has, in terms of quantity. I’m certain I’m not done playing around with the recipe, but I felt good enough about it to share with you. If you prefer a thicker soup or don’t have croutons, I think you could use less liquid for a thicker consistency. As best I can tell, heavy cream and whipping cream are the same thing, give or take a fat gram or two. At my grocery store (HEB), there is an orange container that has one or two fewer grams of fat than the purple container. That is the only difference I can tell. I’ve made this soup with both the 5 fat grams/serving cream and the 4 fat grams/serving cream. I don’t think I’ve ever been able to tell a difference. With what I know now, the more fat it has, the more stable it is. I’m just not sure I understand the impact of having one additional gram of fat per serving. If you know the impact, please do let me know. Check out the Food Education page for a link to one of the more informative pages I looked at in doing my research. This recipe makes ten servings!! That’s so freaking much soup for one person! This is actually very good news for the single gal. The whole recipe takes less than an hour to prepare with most of the time being inactive cooking time so it’s pretty easy to make. Eat a bowl for dinner, and then put up NINE bowls in your fridge/freezer for consumption at a later date. No sense in trying to halve or quarter a recipe to make only that you’ll eat that night for dinner when you can make nine more meals in the same amount of time. I take a bowl to work for lunch or pull a bowl out for an assist with dinner. If you’ll recall my tip about using water to help defrost your food, I use the same concept for the soup. If I’m taking soup to lunch and forget to take the soup out before I go to bed, I’ll put it in the sink with a couple of inches of cold water which will hasten the thawing process before I take it to work. It’s a great go-to, to have in the freezer. Alternatively, it’s an easy soup to make if several friends are coming over for dinner. I’ve gone that route several times, too. I’ll keep you all posted as the soup continues to develop. In the meantime, happy eating! Every 12 – 18 months since 2006, my grandmother, her sisters, and their descendants have gathered at the MCM Elegante Suites in Abilene, TX to visit, eat, and take lots of pictures. It is a great way to stay in touch with some family members, reconnect with others, and meet still others for the very first time. Recently, such a gathering took place, to the immense joy of my grandmother. However, as this was not our first rodeo, there were some welcome changes to our food itinerary. During previous reunions, mostly for ease, we have eaten at the hotel restaurant. I promise you, we were NOT eating there because we enjoyed it. I think for my sister and me (and possibly others), it was the most dreaded part of the entire trip. 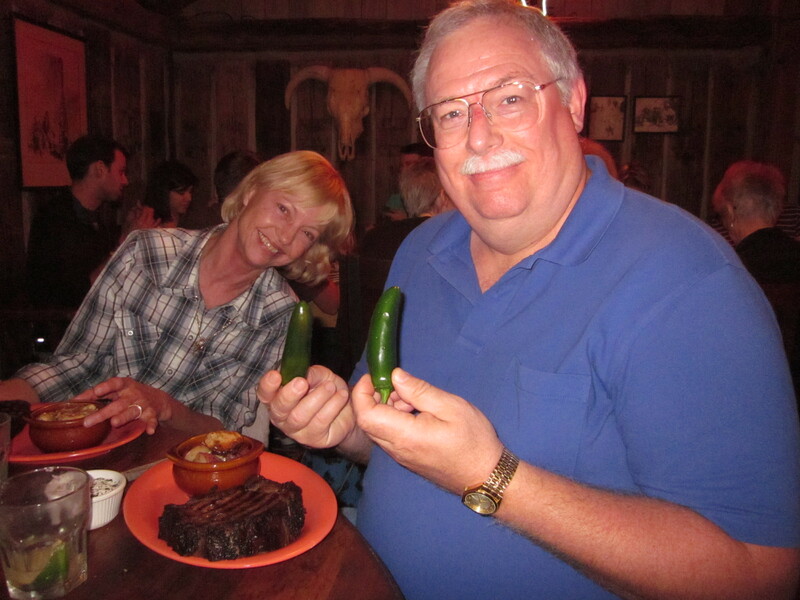 Then…lo, and behold, several months ago, my sister and her husband were at a foodie event and sampled cuisine from Perini’s Steakhouse in Buffalo Gap. Through conversation with the Perini’s rep at the table, my sister discovered that Buffalo Gap is just a few miles outside of Abilene. While I wasn’t there, I’m positive her heart leaped for joy inside her chest. There was a solution to our hotel food woes!! Without wasting any time, Jill began to spread the good word. Eventually we made reservations, despite my father’s warning of “they have big city prices.” He also says, “some things are worth paying for.” He is right on both counts. Transportation logistics were a small concern as was whether or not my grandparents could or would make the trip down the road, but they persevered to make the journey. In fact, all EIGHTEEN of us went. You may have heard the cliche’ about “a diamond in the rough” before, and Perini’s Steakhouse embodies that little phrase like it’s its job. It doesn’t look like much from the front, but don’t let appearances fool you. There was much more than met my eyes. 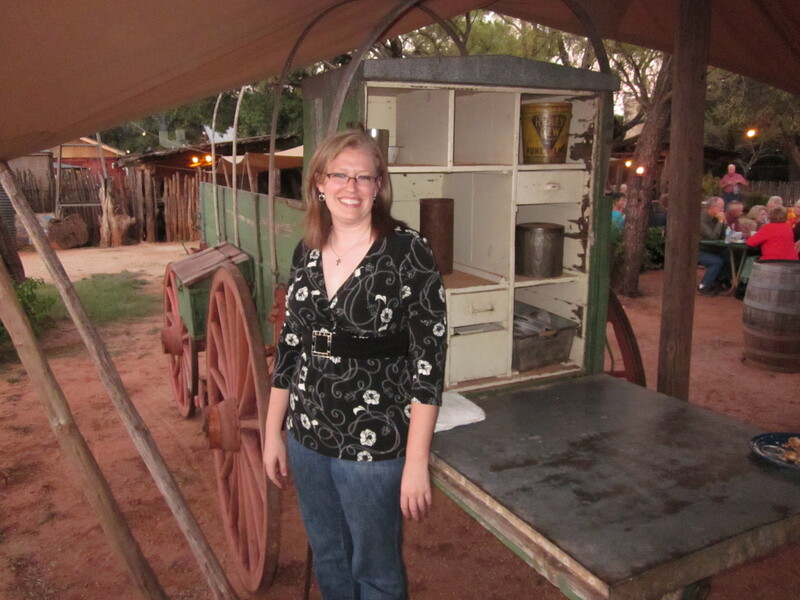 Out back, there was a gigantic seating area and a chuck wagon! Heck, yes, I took a picture with it! Inside, on the menu, there weren’t endless choices, but they did all look delicious. While we perused the food options, I noticed a little warning at the bottom of the menu that said one needed a membership to Perini’s to purchase alcoholic beverages. Eeeekkk! Hold up. A membership? Yes, cowboys and cowgirls, we were in a dry county so memberships are the way Perini’s is able to sell its customers liquor. You can get a temporary membership (covers up to four people) for $3 or a lifetime membership for $25. Well now. 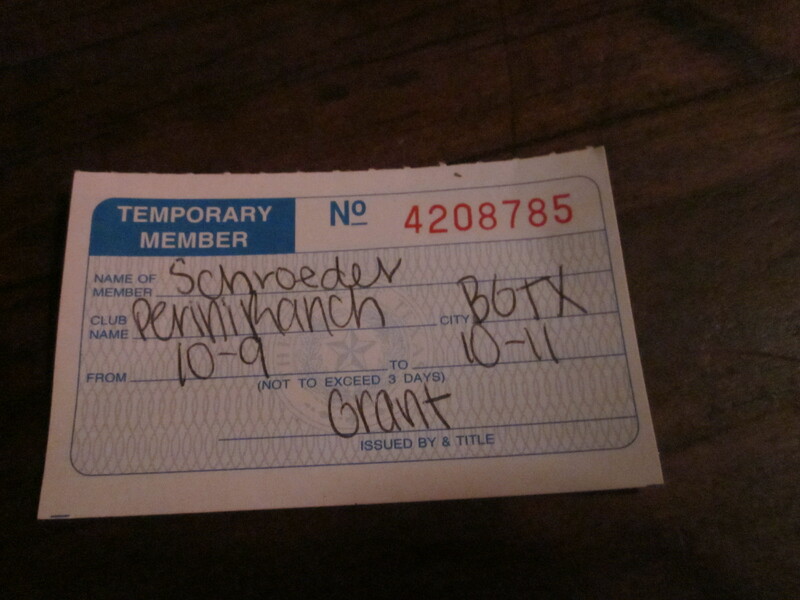 Timothy did get a membership, and of course, I documented it. While I didn’t get my own alcoholic beverage, I did sample the ones around me. 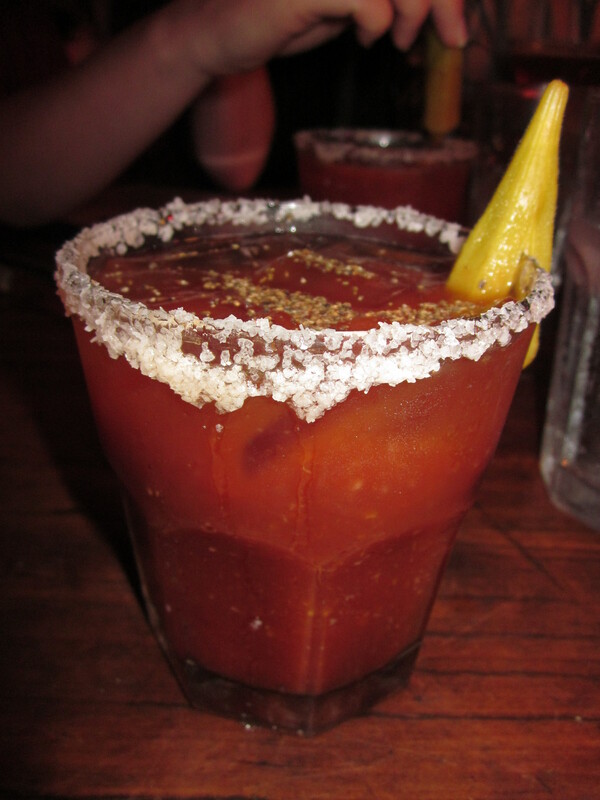 Have you ever had a Bloody Mary? I tried it for the first time this weekend, and it left my brain confused. It was good…but also sort of like drinking liquid cocktail sauce. Strange. 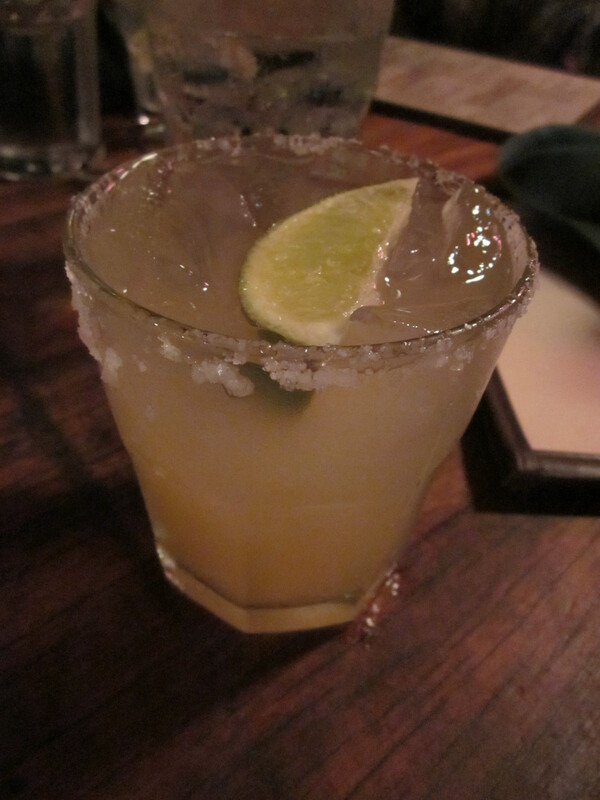 The margarita was deeeelicious! Oh, you want to hear about the food, do you? Well, I suppose since this is a food blog, I could hurry up and get around to it. 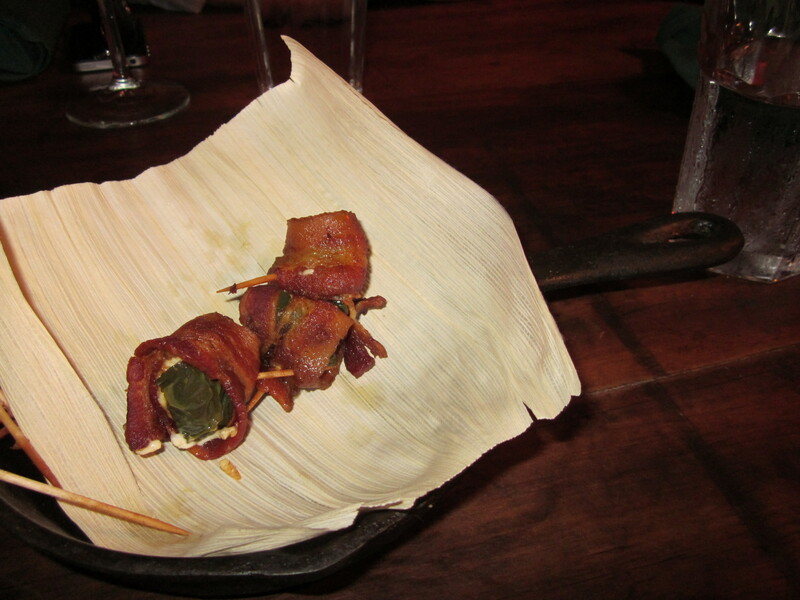 We ordered bacon-wrapped jalapeños for our table along with our steaks. I got the 10 ounce prime rib with cowboy potatoes on the side, steak done medium rare. Normally I’m a straight-up medium gal, but I’ve learned that prime rib is intended to be served medium rare so I do as I’m supposed to with that cut of meat. When the jalapeño bites came to the table, they were served in a wee cast iron skillet – it was TOO cute! I nearly forgot to take a picture of them because we were so busy scarfing them down. I make my own version of these, but I use half of a pepper wrapped in bacon while Perini’s used a quarter of a pepper wrapped in a piece of bacon. I think I might like that better! I thoroughly examined my peppers before I ate them to see how they put it all together. I also think I may go to baking rather than broiling as they had good bacon texture, too. When my steak came out, it was a little redder than I was ready for, but I did not let that stop me from slicing right in. 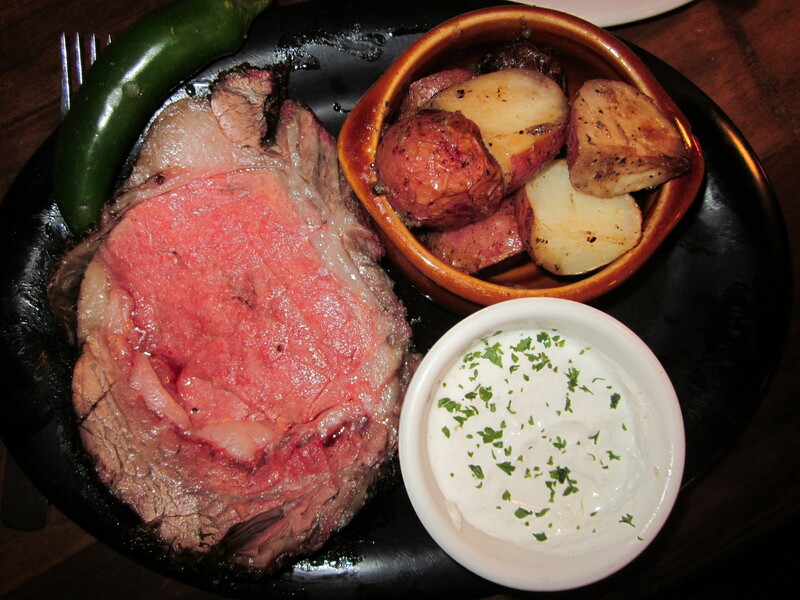 The meat was juicy and tender with a peppered crust, served with a creamy horseradish sauce that I quite enjoyed. And those potatoes?? People, I’m not typically a red potato fan as I don’t always like their flavor or texture. But these potatoes may have changed the way I look at red potatoes. They were buttery and garlicky and creamy and oh-so-eat-every-single-one-of-them delicious. No lie – they were amazing. I surely did clean my plate. So much deliciousness on one plate! Oh! So, most restaurants will frequently use parsley or a lettuce for garnish, right? Well. Parsley is for wimps at Perini’s. Our plates all came garnished with these extremely loooong jalapeño peppers. We were all astonished and impressed! My younger cousin was goaded into taking a humongous bite of his by my brother and one of the younger cousin’s older brothers. I watched that debacle from our table and felt sorry for him when I could see him gagging and spitting it out. Just in case you’ve never been down that road, raw jalapeños should NOT be munched on like an afterschool snack. They really are crazy long peppers! 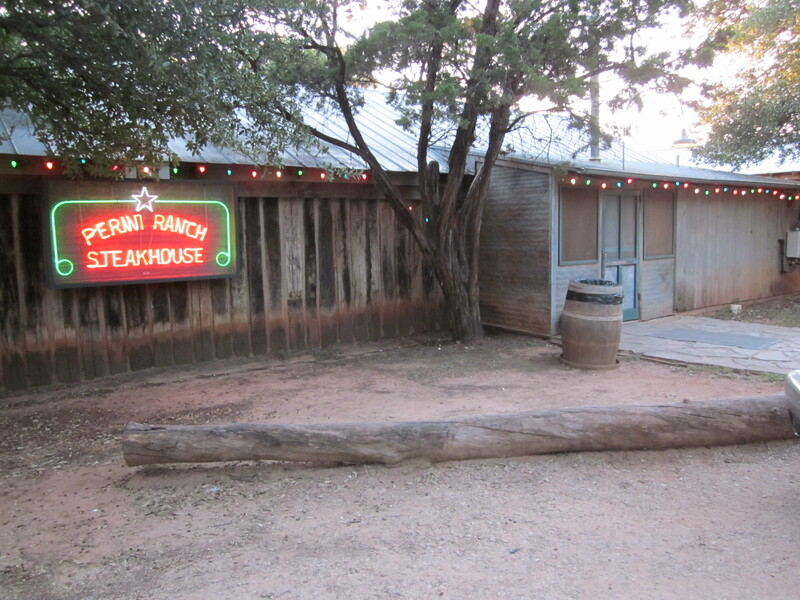 So the take-home lesson today, boys and girls, is that if you are in the Abilene area, take Buffalo Gap road out of Abilene and right on into Buffalo Gap, TX, population 463, and have yourself a wonderful meal at Perini’s. You won’t regret it, and it will certainly make for happy eating!